Stella di Mare’s motto sums up the golf experience at this relaxing northern Red Sea resort perfectly: “Easy access, easy golf.” As the closest Red Sea resort to Cairo, it is reachable by road in just over an hour from the capital. Once on The Links course, golfers are greeted with wide, rolling fairways which invite you to unleash your driver. Strategicallyplaced hazards test the course management skills of every level of golfer, meaning that all 14 clubs in your golf bag should need cleaning at the end of the round, but without being penalised unduly. Water comes into play on six of the holes, including the longest and hardest hole, the dogleg par-5 3rd, and the par-4 16th, another dogleg where three inter-connected lakes virtually maroon the fairway to leave two carries over water to reach the green. Another lake skirting the small green on the par-4 18th requires both precision and nerve. The water theme continues with the aqua driving range, part of practice and training facilities at the club which include the PGA pro-staffed Stella Di Mare Golf & Country Club’s Golf Academy. Lessons are available in English, German, Swedish and Finnish. The Golf Hotel overlooks the practice facilities and academy and is one of three properties forming the Stella Di Mare Resort. A wide stretch of private, sandy beach lapped by the crystal-clear Red Sea fronts the three hotels, offering an array of sport and leisure options. You can flop out on the beach and do nothing or get as active as you like at the diving and water sports centres. Or you can enjoy revitalising natural mud treatments in the shallow waters of the Red Sea as well as a range of other treatments in the pharaonic-style Thalasso Palace, the Middle East’s largest thalasso therapy centre which also offers the latest hydro self-massage equipment. 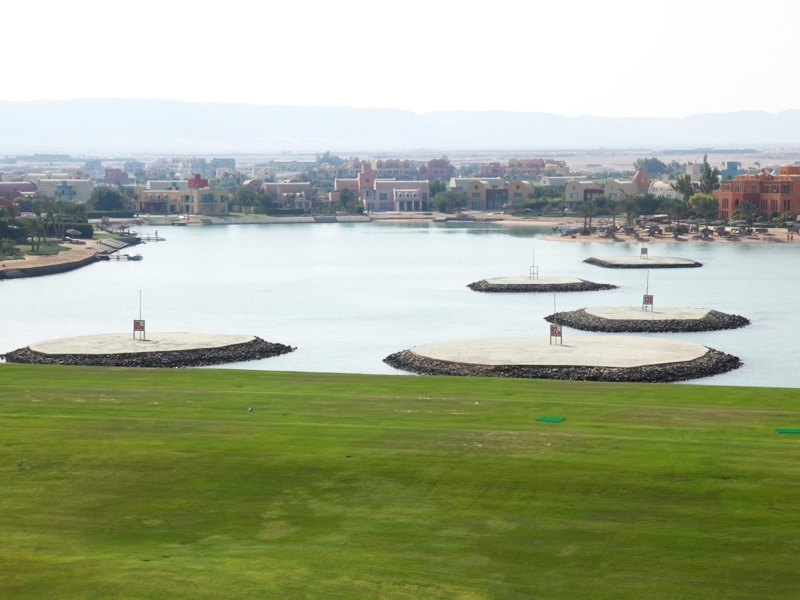 Bold architecture, vibrant colours and a golf course laced by waterways – it can only be El Gouna, a golf destination unlike anywhere else you would have experienced. Just 20 minutes north of the western Red Sea’s gateway resort, near Hurghada airport, El Gouna is known as the “Little Venice of Egypt” for its maze of canals, lagoons and bridges. El Gouna Golf Club lies at its heart: the striking design of the clubhouse is by Michael Graves with Alfredo Freda designed the hotel’s hill and marina. The golf is provided by a near-7,000 yard layout engineered by Gene Bates and Fred Couples, with six sets of tees – three for men and three for ladies – giving a range of options from 4,750 yards. No less originality was put into its creation, with splashes of desert and large bunkers contrasting the blue waters and vivid fairways and greens. The fickle nature of breezes coming in off the nearby Red Sea add to the challenge and require golfers to continually adapt their game. Among signature holes are the par-5 4th, played into the prevailing wind, and the 9th, another par-5 which plays towards the landmark clubhouse tower and challenges longer hitters with its narrow landing zone for the second shot. Tuition is offered by up to four English and German-speaking pros in winter, two in summer. An aqua driving range accommodates up to 30 golfers, and the health and fitness club, managed by the Steigenberger resort and spa operator Angsana, offers welcome relief for aching muscles after around. When not golfing, there are nine dive centres to choose from as well as water sports along the sweeping beaches. Night options include dining in the clubhouse tower French Speciality restaurant, taking in a bar or restaurant in the Mediterranean-style marina, and trying your luck in the casino downtown. The Red Sea’s newest course arrives with a bang during 2008. At 7,500 yards from the championship tees and 7,100 yards from the back tees, the Madinat Makadi course will be one of the longest course in Egypt. An executive, par-3 course has already opened, offering a short game experience in about 90 minutes. Spanning nearly 350 acres and designed by Sanford Golf Design, the championship course – all 18 holes are due to be operational by autumn after the opening of the first nine holes in spring – presents a very different prospect and will feature six tee positions including junior tees giving a distance of 4,600 yards. Salt-tolerant Seashore Paspalum grass is being used on fairways with Sea Dwarf Paspalum grass on the greens, to ensure good playing conditions year-round. Three artificial lakes linked by cascading falls and a host of bunkers will contrast mountains and the deep blue waters of the Red Sea. Twelve of the 18 holes will overlook the Red Sea. 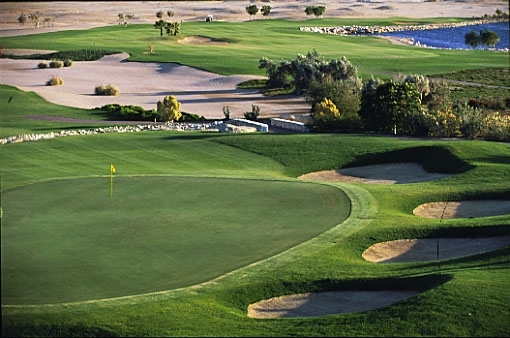 The Madinat Makadi Golf Resort opened in November 2007 with practice and training facilities including an 80-bay dogleg driving range, golf academy and three complete practice holes – a par-3, par-4 and a par-5. The clubhouse will be integrated with a 70-room, five-star boutique hotel and will feature an haute cuisine restaurant and a bar alongside a swimming pool. Madinat Makadi Golf Resort is one of the newest Red Sea tourist resort destinations and is located 30km south of Hurghada, positioned between the golf resorts of Soma Bay further south and El Gouna, to the north of Hurghada. It is just 25 minutes from Hurghada Airport. Conceived as a complete resort village, Madinat Makadi currently comprises eight hotels, including one with a full spa. Leisure facilities are open to guests of all the hotels, and shopping options include a souk market. For golfers who want to fit in a little time on the fairways without impeding on a holiday with the family or partner, the Steigenberger Al Dau Resort offers the ideal solution. Situated at the southern end of Hurghada, on its own private beach, the resort could not be more convenient if you like having all the facilities of a busy resort city close at hand. Hurghada’s city centre is just 5km and the airport is even closer, at 3km distance. The Al Dau course is no championship track down which you can send booming drives. But it doesn’t pretend to be. 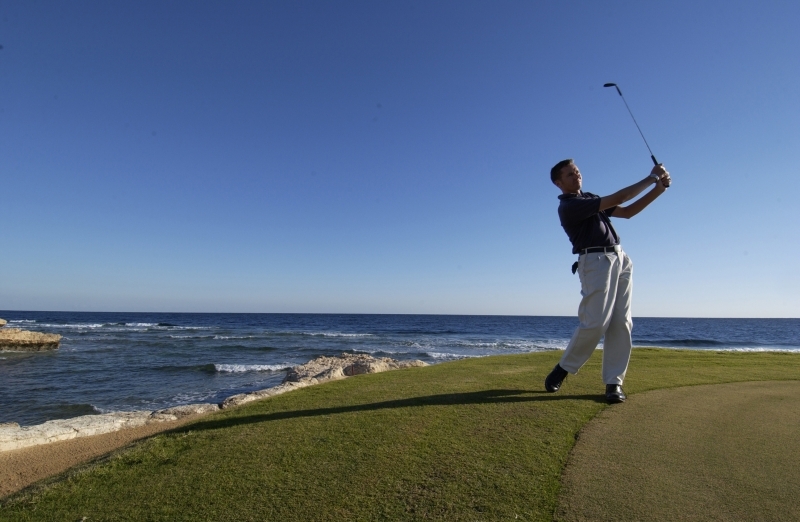 It is a nine-hole, par-3 pitch and putt course nestling between resort accommodation units and a snaking lake on a beach overlooking the Red Sea. Yet this is not mini-golf or crazy golf. The course was designed by Swiss architect Peter Harradine, who has more than 200 courses to his name around the world and who is designing the prestigious Emaar Uptown project in Cairo. Al Dau takes its golf seriously, underlined by the fact that it is a member of prestigious global golf tourism association IAGTO. It even has its own clubhouse with a restaurant, bar and patio, all with views over the Red Sea. Described by its designer, legendary South African golfer and architect Gary Player, as the next Pebble Beach – in reference to the top West Coast US course – The Cascades championship course is a desert links masterpiece right on the Red Sea. Don’t just take his word for it, though. Take on this mighty course, the centrepiece of the upscale Soma Bay resort community 35 minutes from Hurghada, and you will undoubtedly fall for its charms yourself. Readers of German magazine Golf Journal certainly agree. In 2007 they ranked Soma Bay the 5th best course in the world outside Europe. 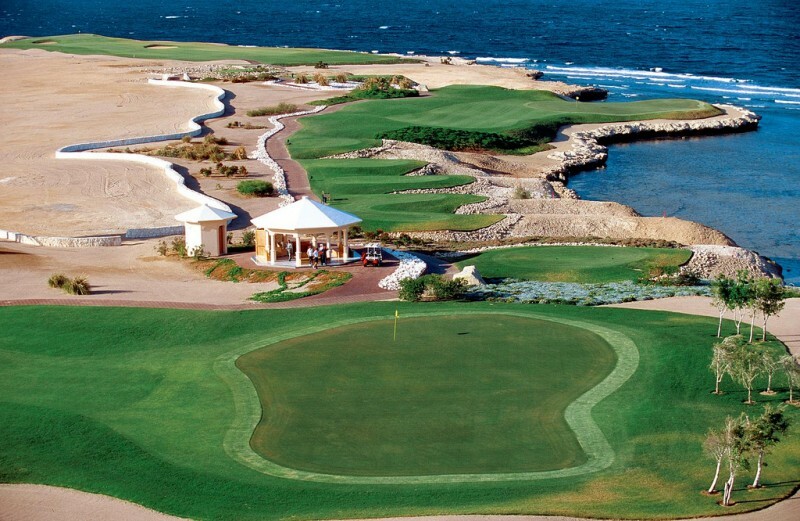 The course carves a verdant figure of eight through arid desert scrub around the Soma Bay peninsula. Several holes are set along the top of low cliffs pounded by waves or swell. Spray sometimes leaps up dramatically as golfers putt on the green of the signature par-3 5th hole, called “The Pebbles of Soma” because it requires an accurate drive over the beach and breaking waves to a green which juts into the sea. Another par-3, the 14th, is known as “Second Signature” for its tee shot over desert to a green backed by the Red Sea. Undoubtedly the most unusual hole is the par-4 12th, featuring twin fairways surrounded by desert which pose a puzzling dilemma when you tee off. A driving range, ninehole par-3 course, which includes an island green, and golf academy complement the course. Among the five hotels in Soma Bay, two of them open from early 2008, luxury hotel La Residence des Cascades is surrounded by the course and houses one of the region’s largest thalasso therapy spas, Les Thermes Marins des Cascades. One of the latest hotels is a 160-room, moderately-priced diving and surfing lodge, situated next to the dive centre. A second 18-hole course is due to open in 2009. The Red Sea is one of the most spectacular dive locations in the world, and its west coast resorts offer a huge choice of sites and experiences. El Gouna alone has well over 30 diving sites including wrecks and coral reefs. It is the closest resort to the celebrated Thistlegorm wreck. Around Hurghada you can find underwater coral gardens and giant gorgonians as well as coral reef islands offshore. Marine life you may encounter on a dive could include huge Napoleon fish, turtles, moray eels, reef sharks, groupers, rainbow wrasse and butterfly fish. Ain Sukhna is an ideal base from which to explore the Eastern Desert and visit its historic monasteries. While not as well-known as St Catherine’s in the Sinai, they are just as fascinating and historically significant. Just 90 minutes from Ain Sukhna, St Anthony’s was founded in 356AD and is the world’s oldest active monastery. Nearby is St Paul’s Monastery, is thought to date back to the 5th century. Both are grand, fortified complexes set in the Red Sea mountains near Za’farana, to the south. A day trip could also include a visit to the Suez Canal. The vast expanses of desert behind the Red Sea are an action-packed adventure zone just waiting to be explored. From Hurghada, Makadi Bay, Soma Bay, El Gouna and other resorts you can take half-day or day-trip excursions into the desert to try camel or horse riding, quad biking, sand sailing, take a 4x4 desert safari, visit a Bedouin village, smoke a traditional hookah water pipe and have a barbeque dinner under the stars after watching the sun go down. It is also possible to cross the desert to visit Luxor in one day. Take a cruise to one of the Red Sea’s many offshore islands on a day trip or evening sunset and barbecue cruise. Watch out for dolphins on the way. From Hurghada, boat trips go to islands including Giftun, a beautiful national park island group and set passengers down on a secluded, sandy beach to spend the day lazing, swimming and snorkelling. For a more romantic touch, you can board a sailing boat in El Gouna and search out coves and unspoilt islands. From Soma Bay, Tobia Island is a small, sandy island which is popular for tourist boat trips.